Redskin? Tan or Sunburned Maybe. Last week’s news: President Obama declared if he was the owner of the NFL Football team the Washington Redskins, he would search for a new team name. Everyone is aware of the controversy surrounding the NFL Football team Washington Redskins name. Today, the team's officials acknowledged that part of their name is demeaning and insulting to a lot of people. Therefore, today, the team has dropped the word Washington from their name. Classic! When I was at Stanford University I wrote a letter to the NFL and to the Washington Embarrassed Skins requesting a change of team name. My boss was not thrilled with the letter. So I wrote another one suggesting the name Washington Black Skins as most of the players were African American, perhaps the name Washington Political Thin Skins, or the Washington White Skins as the owners were Anglos. Needless to say, I was in the 1980s ahead of my time. I received no reply from the NFL or the Washington Redskins football team, but I did manage to place my employment in jeopardy for sending the letters. I don’t think William Shakespeare spent any time in an NFL football locker room. His comment applied to the name of an NFL Washington football team will smell just as bad when considering its demeaning effect on Native American people. There are those who will say American Indians do not find the team name offensive. I am sure you will find some Indians who also say Custer was a misunderstood soldier as well. NFL Team names generally are animals, dolphins, Bengals, Seahawks, Ravens, and Cardinals to name a few. Perhaps the P.E.T.A the animal rights folks will take up this issue. Other names do include non-racial human titles like the Vikings, Buccaneers, Packers and Steelers. I never could determine if the Buffalo Bills were Buffalos or Goats. Perhaps they are Buffalo Bills from the Wild West days although this seems unlikely in that the team is housed in Buffalo, NY. Only the Washington Redskins team chose a racial name based on stereotypic skin color. College teams had their renaissance name awakening in the 1960s to the 1980s when a ruling from the NCAA made it exclusionary if the team used any race based logo or team name. Stanford University Indians became the cardinal (a color in your crayon box). Dartmouth College had a history of being established for the education of the savage Indian, but they also changed their team logo and name to the Big Green. Fourteen other colleges changed their Indian logo including St. Bonaventure University, Wright State University, College of William and Mary, Miami University and Eastern Washington State University. The U.S. Commission on Civil Rights has called for an end to the use of Native American mascots, but only by non-native schools. In cases where universities were founded to educate Native Americans, such mascots may not be examples of cultural appropriation. Examples include the Fighting Indians of the Haskell Indian Nations University and the University of North Carolina at Pembroke, which continues to have a substantial number of native students, and close ties to the Lumbee tribe. Their nickname is the Braves, but the mascot is a red-tailed hawk. The use of Native American images and nicknames in school is insensitive and should be avoided, and may violate anti-discrimination laws. These references are particularly inappropriate and insensitive in light of the long history of forced assimilation that American Indian people have endured in this country. It is particularly disturbing that Native American references are still to be found in educational institutions ... where diverse groups of people come together to learn not only the "Three Rs," but also how to interact respectfully with people from different cultures. The use of stereotypical images may create a hostile environment that may be intimidating to Indian students. American Indians have the lowest high school graduation rates in the nation and even lower college attendance and graduation rates. The perpetuation of harmful stereotypes may exacerbate these problems. Schools that continue [these practices] claim that their use stimulates interest in Native American culture and honors Native Americans, but have simply failed to listen to the Native groups, religious leaders, and civil rights organizations that oppose this behavior. Mascots, symbols and team names are not accurate representations of Native Americans. Even those that purport to be positive are romantic stereotypes that give a distorted view of the past. These false portrayals prevent non-Native Americans from understanding the true historical and cultural experiences of American Indians. Sadly, they also encourage biases and prejudices that have a negative effect on contemporary Indian people. These references may encourage interest in mythical "Indians" created by the dominant culture, but they block genuine understanding of contemporary Native people as fellow Americans. In February 2013 the State of Michigan Department of Civil Rights (MDCR) filed a complaint with the US Department of Education's Office of Civil Rights (OCR). MDCR's complaint asserts that new research clearly establishes that use of American Indian imagery negatively impacts student learning, creating an unequal learning environment in violation of Article VI of the Civil Rights Act of 1964. In June 2013 the OCR dismissed the case on the basis that the legal standard required not only harm, but the intent to do harm, was not proven. In a report on the status of Native American students, the National Education Association included the elimination of Indian mascots and sports team names as one of its recommendations. In 2005, the American Psychological Association issued a resolution "Recommending the Immediate Retirement of American Indian Mascots, Symbols, Images, and Personalities by Schools, Colleges, Universities, Athletic Teams, and Organizations" due to the harm done by creating a hostile environment, the negative impact on the self-esteem of American Indian children, and is discrimination that may violate civil rights. It also impacts non-natives by reinforcing mainstream stereotypes, preventing learning about Native American culture. Stereotyping is disrespectful of the beliefs, traditions and values of Native Americans. Similar resolutions have been adopted by the American Sociological Association  and the American Counseling Association. In the decades following the American civil rights movement, State governments, Federal Civil Rights Commissions and religious organizations have supported the end of using Native American people and their culture as sports mascots. Some institutions have seen the importance of this issue and terminated their offensive mascots. 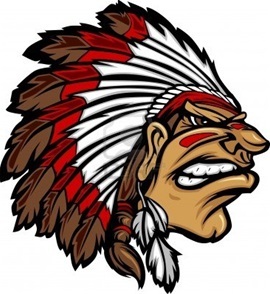 Other schools, colleges, universities and professional teams deny the harm done to Native peoples by the use of Indian symbols, mascots and other cultural items. These institutions resisting mascot change treat the issue in the same manner and plan of the original conquest and subjugation Indian people, divide and conquer. Tribal governments are solicited to support the use of American Indian names. Native American tribal councils have long been in the pocket of conquest government policies and power. It is a history of using Native peoples to conquer other Native tribes. Those used as Indian scouts by the army had little choice for their own survival. The process of subjugation removes the ability of Native governments to make decisions for the continuation of Native culture. Children were sent to boarding school to rid them of their native language, religion and culture. Many tribes found their natural resources stolen by non-natives working with the “elected” puppet tribal governments. It was necessary to go along with the man if any American Indians were to live. Remember the Devil Rays? Now the Rays? Names change. What about the Warriors? should not be such a big deal. Change the name if it offends.